I have bought a FlexiForce force sensitive resistor, which can measure weights from 1-100lbs with a driving voltage of 5V (although I plan on adjusting the range to 10-300 by setting the voltage to 0.5V as described in the Flexiforce documents). However I haven't found an adjustable device where I can set a resistance detector that has an adjustable threshold. I also haven't being doing Electrical Engineering that long! 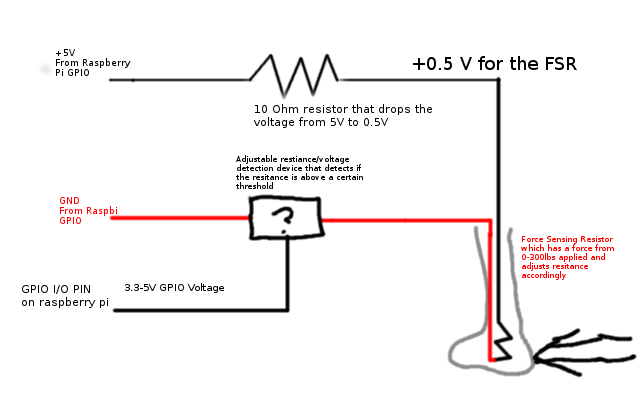 Basically I just want to see if the resistance/voltage reaches a certain threshold and then generates a current on the GPIO for as long as that is the case. Typically you'd convert the changes in resistance from your sensor into changing voltage, a Wheatstone Bridge would be one way to do this, and feed that into a Analogue to Digital Converter that would pass on the voltage to the Pi over the SPI or I2C bus. However, from your question I get the impression you don't care too much about the absolute reading from the sensor but rather want a signal to indicate if it's above or below a predetermined level. In this case we could simplify the circuit somewhat by using a comparator to drive a single GPIO pin (just be careful about keeping the voltages on the GPIO below 3.3v). It would compare the sensor output and your set point on a potentiometer. How much hysteresis you require for your application and so on would determine the final component choice. Not the answer you're looking for? Browse other questions tagged sensor electronics or ask your own question. Can I use a One Wire File System through the GPIO? How can I use the RPi GPIO to make a headphone sensing audio jack? What limits the number of LEDs I can connect to the GPIO? 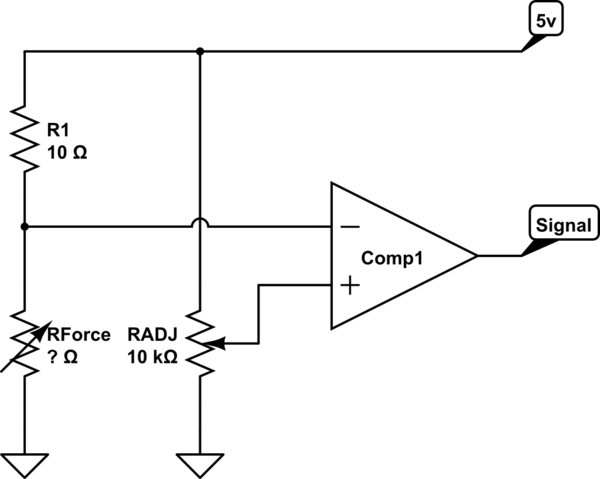 What is the best method to convert analog to digital as well as level shift the signal? On Raspberry PI, how do I pull down a GPIO pin and then read it immediately after?